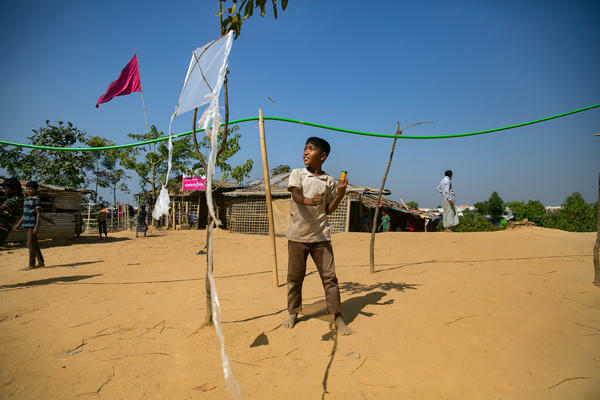 Fayes Khamal tests out a kite he's just made in the Hakimpara Rohingya refugee camp in Bangladesh. Mohammad Arfat flies a kite through the middle of the camp. The 7-year-old says any day he can't fly a kite he feels upset. 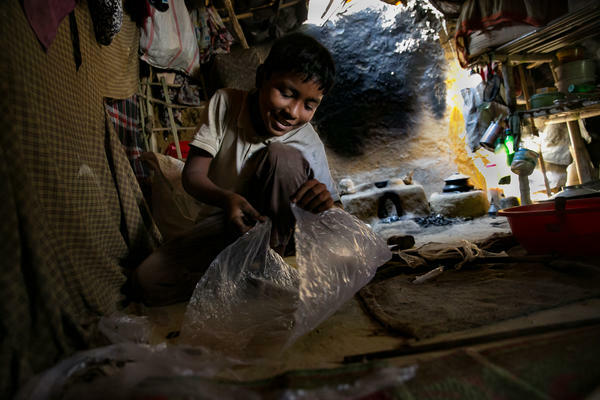 Ten-year-old Khamal makes a kite in his shelter in the camp. He gives the kites away to other kids. Khamal uses discarded pieces of bamboo and plastic to make his kites. Once the toy is in the air, he says he can feel through the string if it's a success or not. If it's bad, he immediately throws it away. One of Khamal's kites flies over the camp. Khamal walks up the hill from his shelter with a kite he's just made. Children fly kites along a ridge in the camp. Many of the refugees fled Myanmar with only a few possessions. For some kids homemade kites are the only toys they have. There's no Xbox or PlayStation for most of the kids in the Rohingya refugee camps in Bangladesh. But there are kites. 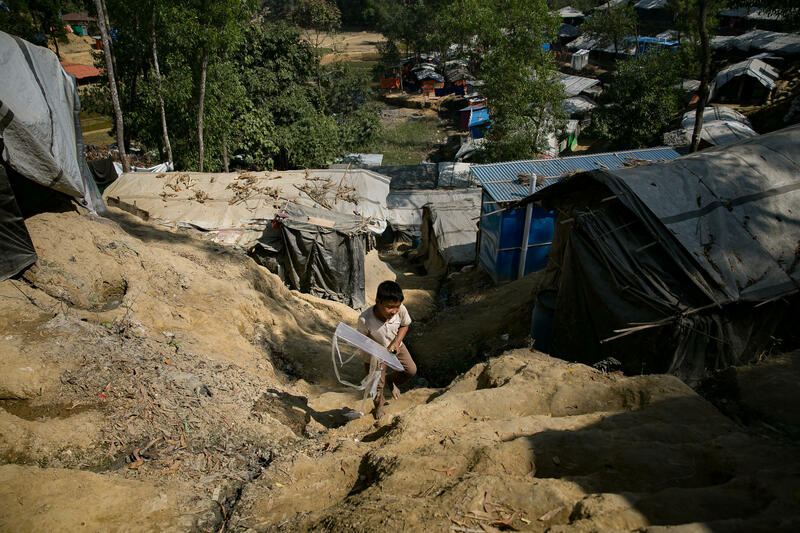 In the late afternoon, a steady wind blows over the hills of the Hakimpara refugee camp. Young boys race to a ridge at the top of the settlement to fly homemade kites. Some of the "kites" are little more than a plastic bag flapping on a string. But some are more sophisticated with long tails and frilly tassels. "This is a new kite and I'm very happy with it," says 7-year-old Mohammed Arfat as he reels out string to a silvery kite 30 or 40 feet above him. Arfat adds that any day he's not able to fly a kite, he feels upset. I ask Arfat where he got his fancy new kite. He tells me that there's "this guy" who makes them and gives them away. The "guy" turns out to be a 10-year-old named Fayes Khamal. "It's easy to make kites but I need to find the materials," says Khamal. "And it takes a bit of time." "If it didn't have arms and a tail the kite won't fly well," he says. "It would spin around in the sky. It needs these extra pieces." He says once he has the materials he needs, it only takes him about 20 to 30 minutes to build a kite. Khamal makes four or five a week and gives them away to younger kids. His mother, Yemma Kulsom, sews clothes to earn extra cash. Khamal often borrows her thread and needles for his kite projects. Kulsom says her son taught himself how to make kites back in Myanmar about three years ago. She says they've gotten more and more sophisticated as he's gotten older. They were forced to flee, she says, after an attack by the military on Rohingya rebels. "When we heard that soldiers were coming toward our village, everyone hid in the forest," she says. "When we emerged the soldiers had burned down our houses. That's when we decided to come here to Bangladesh." Kulsom says her dream for her son is that he gets a good education. He attends a school that meets for two hours most afternoons. In the mornings, he goes with his father to the edge of the camp to collect firewood. She says Khamal is a good student and she thinks maybe he could be a teacher when he grows up. Khamal says he'd prefer to be a shopkeeper. For now, however, he's the "kite guy." Once he finishes making his latest kite he takes it out for a test flight. The camp is dry. Powdery beige dust covers just about everything. Khamal starts to run up a path that cuts between the shelters. His kite rises up behind him. It flits through the air like a fish fighting its way upstream. The opaque plastic shimmers in the sky. Its tail darts from side to side. Khamal beams up at his homemade kite. For a moment it's the brightest object in the camp. In Bangladesh, hundreds of thousands of Rohingya refugees are now living in sprawling makeshift camps after they were driven out of Myanmar. Humanitarian groups are preparing for them to be in Bangladesh for months, if not years to come. That means the refugees will have to live in these grim conditions for who knows how long. NPR's Jason Beaubien met one young refugee who's getting people to look up in the sky and find a little bit of joy in the wind. 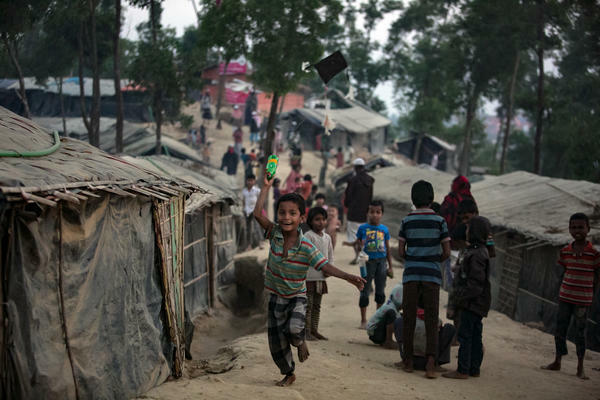 JASON BEAUBIEN, BYLINE: In the late afternoon, as men converge for prayers, the wind blows strong and steady over the hills of the Hakimpara refugee camp. 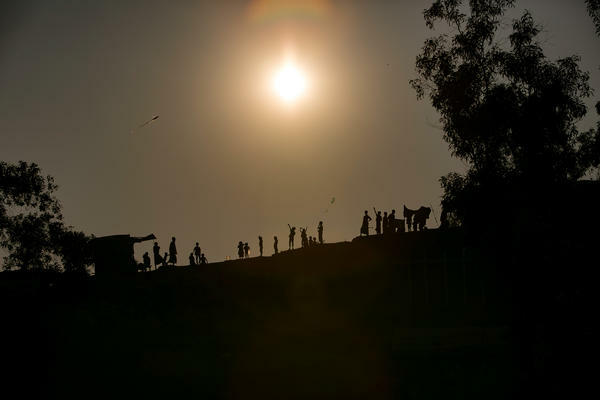 Young boys race to a ridge at the top of the camp to fly homemade kites. 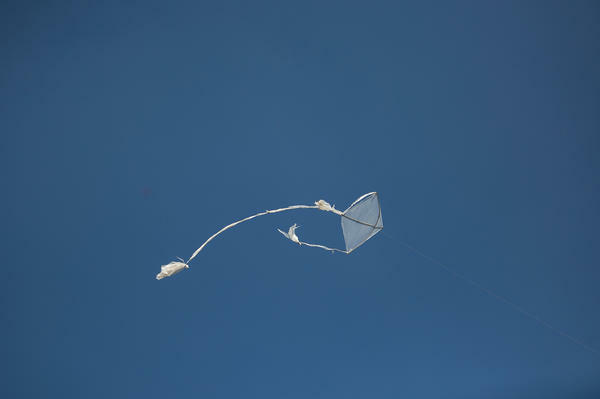 Seven-year-old Mohammed Arfat reels out string to a silvery kite 30 or 40 feet above him. MOHAMMED ARFAT: (Through interpreter) This is a new kite, and I'm very happy with it. BEAUBIEN: Mohammed adds that any day that he's not able to fly kites, he feels upset. I ask Mohammed where he got the kite, and he tells me that there's this guy who makes them and gives them away. The guy turns out to be a 10-year-old named Fayes Khamal. BEAUBIEN: Fayes is making a kite out of pieces of castoff bamboo and opaque plastic sheeting. FAYES KHAMAL: (Through interpreter) This is the support for the kite, and it helps it fly. BEAUBIEN: He uses a razor to cut the plastic into a diamond shape, and he splits the bamboo into strips with a machete. BEAUBIEN: He makes a T-shaped frame for the kite and then stretches the plastic over it. Then he cuts another plastic bag into strips and teases out the ends into frilly tassels. Fayes attaches these to the kite to make what he calls arms and a tail. FAYES: (Through interpreter) If it didn't have arms and a tail, it wouldn't fly well. It would spin around in the sky. It needs these extra pieces. BEAUBIEN: He can build a kite in about 30 minutes. Fayes makes four or five a week, he says, and gives them away to younger kids. 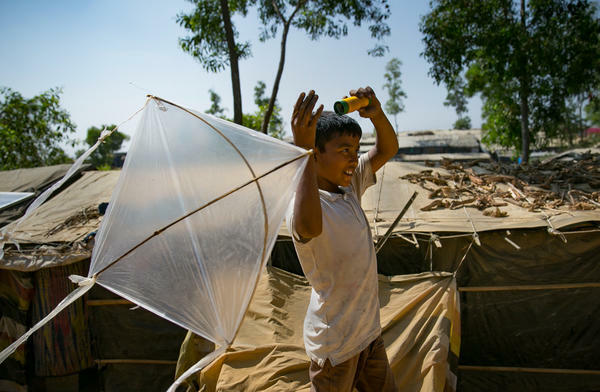 His mother, Yemma Kulsom, says her son started making kites back in Myanmar. They were forced to flee, she says, after a series of attacks by the military on Rohingya rebels in the area. YEMMA KULSOM: (Through interpreter) When we heard that the soldiers were coming towards our village, everyone hid in the forest. When we emerged, the soldiers had burned down our houses. That's when we decided to come here to Bangladesh. BEAUBIEN: She's hoping her family can be resettled into a refugee program in Europe or Australia. Kulsom's dream for Fayes is that he gets a good education and grows up to be a teacher. Fayes, for his part, says he'd like to be a shopkeeper. But for now, he's the kite guy. Once he's finished making his latest kite, he takes it out for a test flight. The camp is dry, and powdery beige dust covers just about everything. Fayes starts to run between the shelters. His kite rises up behind him. It flits through the air like a fish fighting its way upstream. Its tail darts from side to side. The plastic shimmers in the sky. Fayes beams up at what, for a moment, is the brightest object in the camp. Jason Beaubien, NPR News, Cox's Bazar, Bangladesh. (SOUNDBITE OF POPPY ACKROYD'S "RESOLVE") Transcript provided by NPR, Copyright NPR.